Acts 26 – Who was Agrippa? Agrippa’s sister Bernice was also the sister of Drusilla, Felix’ wife. Bernice had been married twice and was now a widow living in her brother’s court. Rumors were that they were having an incestuous affair (Ant 20.145) The Roman satirist Juvenal referred to a gift “given as a present long ago by the barbarian Agrippa to his incestuous sister, in that country where kings celebrate festal sabbaths with bare feet and where a long-established clemency suffers pigs to attain old age” (Juv. 6.158). To stop this rumor, she married for a third time, but quickly returned to her brother. Eventually Bernice moved Rome and was the mistress of Titus. Agrippa himself never married nor had any children. Agrippa’s father died when he was 17 and Claudius thought he was too young to take control of the kingdom. Like the others in the Herodian line, he sought favor from Rome and was eventually given the title king in A.D. 53. In addition, he was given the title “custodian of the Temple Treasure.” meaning he had the right to appoint the high priest. He expanded Caesarea Philippi, renaming the city Neronias to honor Emperor Nero. Agrippa was known to have been sensitive to Judaism, even to the point of debating points of law with the rabbis (Anitq., 20.179, 194-196). He purchases expensive metals and timber for the Temple which was repurposed during the Jewish war for the defense of the Temple (JW 5.36). But he was also very pro-Roman, having been raised in the Imperial court itself. When the rebellion began, more he and Bernice sought to stop the rebels, knowing that Rome would not tolerate a rebellion in a minor province. He is, therefore, the highest ranking political authority in Palestine. It is appropriate that he present himself before the new Roman procurator Festus. What is more, he provides Festus with the information he needs in order to write a report explaining Paul’s case to Rome. He was in Egypt when the Jewish revolt broke out in A.D. 66. He returned to Jerusalem and attempted to stop the rebellion. When this failed, he stayed with Vespasian and Titus during the war (JW 2.426). He was given a sizeable military force (JW 2.500). He used this force to lay siege to the town of Gamala for seven months. Josephus himself was in charge of defense of the town (JW 4.1-10; Life 1.114-121). Josephus reports a lengthy speech by Agrippa (JW 2:345-401), although it is likely this speech is as much Josephus’s own view of Rome some twenty years after the war. 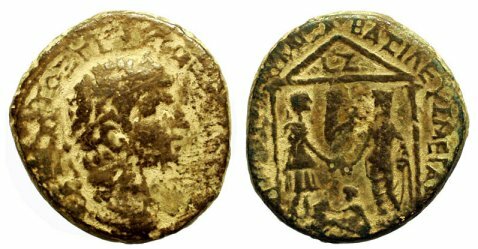 Agrippa was rewarded for his loyalty with additional territory and was permitted mint coins in 73-74 in Caesarea with the words “For Emperor Vespasian Caesar Augustus.” He died about the year 100 after a 47 year reign. Bibliography: David C. Braund, “Agrippa (Person),” ABD 1:99-100; Emil Schürer, A History of the Jewish People in the Time of Jesus Christ 2:191-204; Frank E. Dicken, “Agrippa II,” The Lexham Bible Dictionary. 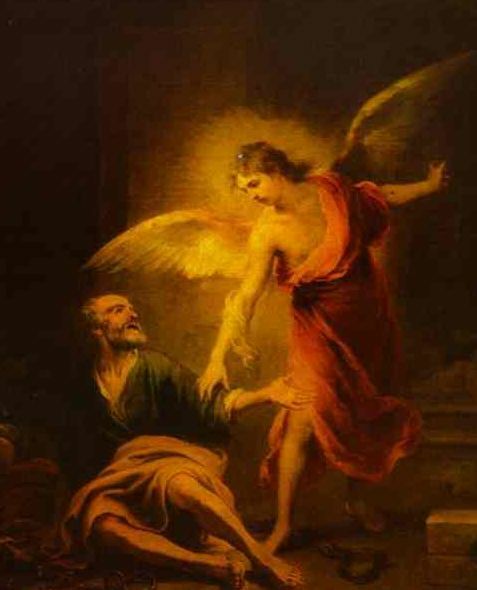 Peter’s rescue from prison is one of several miraculous escape stories in Acts. Dunn points out that this sort of story is almost a distinct genre in ancient literature (Beginning from Jerusalem, 408). There are several of these sorts of stories in Acts. Luke tells the story with intentional humor (Peter has to be roused by the angel, Rhoda plays the dizzy serving girl, etc.) But there is more going on in the story than an amusing anecdote about Peter escaping prison and execution at the hand of Herod Agrippa. While Peter is in prison, people were gathered at Mary’s home praying. Mary is the mother of John Mark, and her home appears to be the location of a house church. Her husband is not mentioned so she may be another wealthy widow who supports a local church (like Tabitha, for example). John Mark may have some role as a leader in the church along with Peter. The evening that Peter is rescued, this community is gathered to pray. What Luke does not tell us is what were they praying for. It is possible that this is simply a meeting of a house church for a prayer time. It is the Passover, so it is possible that these Jewish believers gathered at Mary’s house to share a Passover meal and then spend time in prayer after the meal. But given the context it is reasonable to assume that they were praying for Peter. However, if they were praying for his release, then their response to Peter’s escape from prison is unusual. When Peter knocks at the door the servant Rhoda is so overjoyed that Peter is at the door she forgets to let him in to the house! 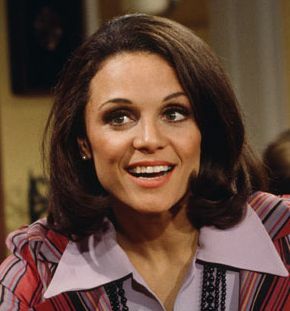 When she reports that Peter is at the door the people gathered to pray think that she is “out of her mind” (μαίνομαι, literally, “you’re crazy”). They even suggest that she has seen “Peter’s angel.” Neither response sounds like they expected God to answer a prayer to rescue Peter. John Polhill thinks that this might be a reference to the Jewish belief in guardian angels, or perhaps spirits of the recent dead who lurk for a time after death. Polhill cites Tobit 5:4-16, although this is not exactly the same sort of situation (Acts, 282) . Even when Peter finally gets into the house, the whole group is amazed by this escape. If they were praying for escape, they seem rather surprised by it. It is more likely that the gathered church was praying that Peter would actually die for his faith and not deny Christ. It must have been well known by this point that Peter and the twelve all once denied Christ. Peter’s denial was most spectacular, denying his association with Jesus three times soon after he declared his loyalty to Jesus. With the apostle James dead, perhaps this group is worried that Peter will not be able to withstand the pressure and he will deny that Jesus was in fact raised from the dead. A denial of this sort would be a disaster for the Jewish Church in Jerusalem. This story underscores the importance of fa faithful witness in Acts. The gathered believers want Peter to be that faithful witness, willing to continue to declare his faith even if he pays with his life. Peter is a changed man after the resurrection and he has already stood up to the Sanhedrin on several occasions. This story demonstrates that faithful witness may be required not simply to live for Christ, but also to die for him. Herod Agrippa begins to persecute the church in Jerusalem (verse 1). The Herod of Acts 12 is Agrippa I. Later in Acts we meet Agrippa, he is Herod Agrippa II (Agrippa II is Marcus Julius Agrippa, Acts 25-26). Born about 10 B.C., Agrippa I was the grandson of Herod the Great, the son of Aristobolus and Bernice. He was raised in Rome, and was a fried of Caligula and Claudius as well as Tiberius’ son Drusus. He was able to exploit the relationships in order to gain wealth and power. He sought the favor of Caligula to the point that the Emperor Tiberius imprisoned him for six-months on charges of treason. In A.D. 41 Agrippa used his relationship with Caligula to help prevent the installation of a statue of the emperor in the Temple in Jerusalem. When Caligula was assassinated, Claudius made Agrippa ruler over considerable territory in Judea. Schürer argues Agrippa was favorable to the Pharisees and even to some extent a Jewish nationalism (2:159). This may be plausible given his zealous persecution of the Jewish Christians in Acts 12. That James would be the first of the disciples to be martyred was anticipated even during Jesus’ ministry. In Matthew 20:20-28 James and John ask to sit and the right and left hand of Jesus in the Kingdom. Jesus’ response is to hint at the sort of service which he is about to offer–he is about to drink the bitter cup of God’s wrath as he gives up his life as a ransom for many. The brothers say that they are able to do so, just as Peter thought that he would be able to go to prison or die for Jesus only a few days later at the last supper. All three of the inner circle swear ultimate loyalty, and at least initially, all three fail. Jesus grants them at least part of their request – they will drink the same cup, although it will be different for each of the brothers. James is the first to be martyred, John lives a very long life, and according to an early tradition, was persecuted greatly during the reign of Domitian. James’ death is about eleven years after the martyrdom of Stephen. It therefore appears that the people of Jerusalem are no longer supportive of the Jewish Christians. Witherington makes this point; the city of Jerusalem has “turned against” the Jewish church (Acts, 386). Agrippa is therefore demonstrating his piousness by pursuing the leaders of the Christian community. Bibliography: David C. Braund, “Agrippa” ABD 1:98-99; Schürer, 2:150-159. Herod the Great took the minor Hellenistic kingdom of Judea and successfully transformed it to a major kingdom with international influence and prestige. Although known to most Christians primarily for his pursuit of Jesus in Matthew 2, Herod was a masterful politician in the Roman world. Adam Marshak argues in this fascinating book that Herod succeeded as the King of Judea despite his dubious lineage and weak claim to the throne because of his political skill and flexibility (335). Adam Marshak wants to get beyond the popular view of Herod as an evil monster perpetuated in popular preaching and see Herod as an example of an ideal Roman client king. Herod appeared to the Romans as an ideal client king yet also claimed to be a successor to David and Solomon. Marshak offers an example of how Herod could be both a Roman and Jewish king. During the procuratorship of Felix there was a dispute over Caesarea—was it a Greek or Jewish city? Both sides appealed to Herod as the founder to support their claim (254). This illustrates something important about Herod, he was able to play to the interests of Roman, Greek, and Jewish constituencies in order to increase his own power and prestige. Marshak’s title, The Many Faces, alludes to Herod’s uncanny ability to appeal to all three of these cultures. In order to study Herod within the proper cultural and intellectual milieu, Marshak begins with three chapters explaining why Rome used client kings and the ideal Hellenistic monarchy. As Rome expanded, it was expedient to use local kings to support Roman interests in newly acquired territories. Client kings were supported by the Roman army and were part of the Roman patronage system, often receiving citizenship and other honors. Since the client king relied on Roman patronage, the client king would honor patrons with gifts and other support. Although Rome allowed some autonomy for client kings, they had access to Roman culture and technology. Herod took advantage of advanced Roman engineering to build Caesarea and the Temple in Jerusalem. Hellenistic kings were expected to be virtuous lawgivers who were generous with their great wealth. In addition, Hellenistic kings were to protect their people and piously honor the gods. The third chapter in this section is an overview of history from the Maccabees to Herod. Although this history is well known to most readers of the book, Marshak is interested in demonstrating the fact the Hasmoneans were already Hellenistic kings, despite their origins in the Maccabean revolt. By examining inscriptions and coinage, he describes the tension between the duties of a Hellenistic king and being a king of the Jews. In the second section of the book, Marshak traces Herod’s rise to power. Herod began his career as a governor of Galilee in 47 BCE. Despite being an outsider in the Judean court, during this period Herod proved himself to be loyal to Hyrcanus II, but he was clearly ambitious (90). 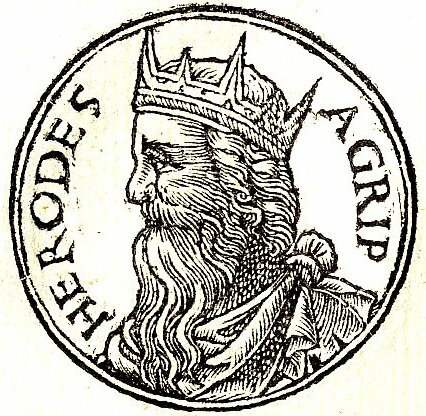 From 42-30 BCE Herod managed the difficult political waters of the Roman civil war first by supporting Anthony then Augustus in order to prove himself to be “a useful but unassertive client king.” After he was appointed as king by the Romans, Herod needed to present himself to the Jews as a “new Hasmonean.” This would be difficult since he was Idumean who ruled by the power of Rome. Herod married the granddaughter of Hyrcanus II, Mariamme, in order to have a claim to the Hasmonean throne. Herod also built or re-built several desert fortresses and palaces in order to defend Judea but also to connect his reign to the Hasmoneans. Marshak also examines Herod’s early coinage and argues the symbolism of these coins was intended to connect Herod to Jannaeus and the other Hasmonean kings (129). The third section of the book describes Herod’s self-presentation as an ideal client king in an Augustan world. As Marshak showed in the first early chapters, a good Roman client king provided military support to Rome and sought Rome’s advice for major decisions. In addition, the client king publically honored his Roman patron and actively Romanized their kingdom (141). Herod was able to support Rome both militarily and financially. By sending gifts to Augustus, Herod bought the trust of the Emperor and demonstrated he was an important and powerful man in the Mediterranean world (145). He built Sebaste and Caesarea to honor the Emperor and publically honored the Emperor in other Hellenistic cities. For example, two inscriptions were found at the Acropolis in Athens describing Herod as a “friend of the Romans” and another as “Pious, Friend of Caesar” (155). Since a good client king Romanizes his territory, Herod slowly brings Judea into the Roman sphere. Marshak devotes two chapters to this issue. First, he lists a series of practices Herod introduced to make Judea a part of the larger Roman world. First, he sent eight of his sons to Rome for their education. Second, Herod imported luxury goods from Rome. At Masada sixty-five amphorae were discovered with Latin commercial inscriptions. These contained imported wine, honey, apples and Garum, a Roman fish sauce (178). These imports are evidence of economic trade relations with the west. Third, Herod may have Romanized the army, although there is no irrefutable evidence for this (190). Fourth, Herod built Roman style buildings throughout his kingdom, including baths, villas, amphitheaters and theaters, hippostadiums. Perhaps the most significant Roman buildings were temples at Sebaste and Caesarea (Augusteum). These temples included cult statues to Roma and Augustus (212). Fifth, Herod took advantage of advanced Roman engineering to build the artificial harbor at Caesarea and in his expansion of the Temple Mount. Last, Herod used Roman decorative techniques in al of his buildings (opus reticulatum and opus sectile). Marshak also demonstrates Herod was an ideal Hellenistic king. He lists a number of examples of Herod’s many benefactions (euergetism) divided into four categories: buildings and urban structures, endowments, tax assistance and monetary gifts, and personal intercession (232). Since Herod was an extremely wealthy king, he would be expected to do “good works” with that wealth. Herod gave money and assistance to cities outside his control (including Athens and Antioch). Although Herod’s benefactions were gifts, they were calculated to create friendship and good will with Rome and its leaders (247). Within Judea, Herod spent huge sums on buildings designed to bring honor and prestige to Judea, increasing his own honor. The best example of this is the Herodium, which Marshak accepts as Herod’s tomb (264). Of the characteristics of a Hellenisitic king, piety toward the gods was the most difficult for Herod since offering proper respect to the gods of Rome at Sebaste or Caesarea would offend his Jewish population. Marshak describes Herod’s “careful political triangulation” of three cultures (273). With respect to Imperial worship, for Herod what happens in Caesarea stays in Caesarea. Although the detail are held until the final chapter of the book, Herod’s efforts to expand the Temple to largest in the ancient world made Jerusalem a pilgrimage destination for Diaspora Jews and demonstrated is piety toward the God of Israel. The final two chapters of the book deal with Herod as the king of the Jews, Melekh HaYehudim. Just as he intentionally styled himself as an ideal Hellenistic king, Herod wanted to be seen as a legitimate successor to David and Solomon. Because he was Idumean this was impossible and it was equally impossible for him to be seen as the founder of Jerusalem. For this reason he sought to build in and around Jerusalem. According to Marshak, Herod “is engaging with his Jewish past by using a Hellenistic vocabulary” (281). The Temple is the key example of Herod’s piety, but also an indication Herod wanted to be seen as a new Solomon. Marshak concludes that Herod was not a Hellenized Jewish king who was enamored with Rome. He was “a fully Hellenistic, Romanized Jewish king, the first of a new breed of Jewish rulers who felt at home in each of these worlds” (285).Was Herod successful? As Marshak observes, he had a long peaceful reign and died at an old age, leaving his kingdom to his sons for several generations (311). Conclusion. Marshak contributes a scholarly yet readable introduction to Herod the Great. Yet the book is also valuable for understanding the client kings in the Roman world. Marshak provides rich footnotes on virtually every topic in the book, making this book a valuable resource for future research. This book is a welcome addition to Nikos Kokkinos The Herodian Dynasty (Sheffield, 1998) and his more recent The World of the Herods (Franz Steiner, 2007). Although Marshak includes many architectural details, his books should be supplemented with Ehud Netzer’s Architecture of Herod, the Great Builder (Baker, 2008). It is possible most readers will approach this book as “background” for the New Testament, but that is not the purpose of the book. There are only nine references to the New Testament listed in the index, all in footnotes. Certainly a better understanding how Herod controlled Judea prior to the events of the Gospels and Acts will illuminate biblical texts, but that is not Marshak’s immediate goal. Herod’s “careful political triangulation” of Roman, Greek and Jewish cultures is exactly the kind of world in which Jesus lived. Paul’s mission also was a “careful triangulation” of these three cultures. This book contributes to our growing understanding of the tensions Jewish people experienced in the Second Temple period. Acts 12:1-2 – Why Did Herod Kill James? The Herod mentioned in Acts 12 as a persecutor of the apostles was Herod Agrippa I (10 B.C.- A.D. 44). He was the grandson of Herod the Great and was educated in Rome. He was a friend of the imperial family, but supported Caligula as the successor to Tiberius and was imprisoned as a result. When Caligula became emperor, Agrippa was released and was given the title of King and the territories formerly held by Herod Philip and Lysanias, and later the territory given to Herod Antipas. Agrippa was a key figure in persuading Caligula to rescind his order to place an image of himself in the Temple (JW 2.206-13, Antiq. 19:236-47). We are not told why Herod persecuted the church in Jerusalem, although it may be that he was in some respects interested in his “Jewish roots.” This piety was demonstrated upon his return to Judea. He donated a golden chain, given to him by Caligula when he was freed from his imprisonment, to the Temple. In addition, he undertook the sponsorship of a large number of Nazarite vows in the temple (Antiq., 12.6.1, Schürer 2:155). James’ death is about eleven years after the martyrdom of Stephen, probably about A.D. 41-42. Agrippa may have been motivated toward this persecution by zealous Pharisees (like Paul) who sought to suppress the Jews who taught that Jesus was resurrected from the dead. It even appears that the people of Jerusalem no longer support the Jewish Christians. Witherington makes this point: the city of Jerusalem has “turned against” the Jewish church (Acts, 386 ). A further motivation for the summary execution of James may be the messianic claims of the apostles. If Caligula was inclined to demand his image be honored in the Temple, then perhaps messianic fervor among the Christians was high. Jesus himself predicted an “abomination which causes desolation” similar to the offenses of Antiochus IV Epiphanes (Dan 9:25-27, Mark 13:14 and parallels). Agrippa is therefore acting like a pious devotee of the Jewish faith by pursuing the leaders of the Christian community who promote the teaching that Jesus is the Messiah. If this is true, how does this play out into the overall themes we have been seeing in Luke? Is Herod the “ultimate fringe” of what it means to be Jewish? Bibliography: David C. Braund, “Agrippa” ABD 1:98-99; Schürer , 2:150-159. Herod the Great is one of the well-known historical figures from the New Testament. Although he dies just after Jesus is born, his influence continues well after his death. His sons rule the region of Palestine until the Jewish War in A.D. 66. He was appointed procurator of Judea by Julius Caesar in 47 B.C., and King in 37 B. C. Since Herod was only half-Jewish, and was hated by the Jews because he was an “outsider.” He was an excellent administrator and politician. Since he ruled with the ruthless efficiency respected by Roman Empire he was left to run his kingdom with no interference from Rome. He began an aggressive building campaign throughout the region, but especially Jerusalem. Despite marrying an Hasmonean princess, Mariamme, he was never accepted by the Jewish people as a Jewish king. His family was Idumean, forcible converts to Judaism, and therefore not really Jewish. Perhaps in an attempt to win favor with the Jewish people he expanded the Temple mount and re-built the whole complex, making it one of the most beautiful temples in the ancient world. Herod wrote a will that divided Palestine between three of his sons (he had ten wives, all of whom wanted their child to succeed him.) The three remaining sons, each took the title “Tetrarch” (ruler of a fourth) or “Ethnarch” (ruler of people). Herod is usually remembered as the madman who slaughtered the infants in Bethlehem in an attempt to kill the Messiah. This is true, Herod was a brutal and paranoid man who killed his own wife and children in order to prevent them from rebelling against him. It is true that Herod was a evil person who ruled with an iron fist. But early in his reign he was a skillful administrator who was able to control a rebellious province. What is more, he initiated many building projects which brought Judea respect in the Roman world. Herod built several fortress-palaces, included Masada and the Herodium. Masada is a well known desert palace built by Herod, although the Hasmonean king Alexander Jannaeus was the first for fortify the mountain. The Herodium is near Bethlehem and was designed by Herod as a fortress and burial site. Perhaps Herod’s greatest achievement was this renovation of the Temple in Jerusalem. When it was finished, it rivaled Solomon’s Temple in glory. He began in 19 B.C., and finished the temple in 18 months, but took another 8 years to build the courtyards. Although the complete Temple complex was not finished until A.D. 64, Herod doubled the size of Zerubbabel’s temple. Since the design of the Temple is found in scripture, Herod expanded the buildings around the Temple, enclosing the original mountain in a rectangular box and expanded the buildings associated with the Temple area. The port-city of Caesarea Maritima was marvel of architecture and engineering. Herod built a thoroughly Roman city which was a tribute it his power and wealth. The artificial port at Caesarea is one of the more amazing structures built by Herod. Caesarea was built as a Roman city included a theater and hippodrome. The best text on Herod’s building projects is Ehud Netzer, The Architecture of Herod the Great Builder (Grand Rapids: Baker, 2008). This is an excellent description of Herod’s projects. It is technical, but still readable. The audio for this week’s evening service is available at Sermon.net, as is a PDF file of the notes for the service. You should be able to download the audio directly with this link, if you prefer. In this chapter we see some significant changes in the church at Jerusalem. James has been killed and Peter is about to die at the hands of Herod Agrippa. It is only by a miraculous rescue that Peter avoids martyrdom in A.D. 44. After Peter is rescued from prison, he tells the group which had been praying for him to report to James what has happened. This is James, the Lord’s brother. At this point in the story, we did not know that he was a believer, but he will be one of the major leaders of the Jerusalem church by Acts 15. During Jesus’ ministry, the Lord’s family did not believe that he was the messiah. After the resurrection we are told in 1 Cor 15:3-5 that Jesus appeared to James at some point. We presume that after this appearance, James became a believer in Jesus as the Messiah. James has a reputation for being an extremely zealous Jewish believer, and a leader among the Pharisees and priests who accepted Jesus. This will be a problem later for Paul, but at this point we are only told that James is some sort of a leader in the Jerusalem church. Some scholars have seen this passage as an indication that there is a shift in leadership in the Jerusalem community from Peter to James. This is possible (and I would even go so far as to say probable! ), but it remains only a hint in this chapter. James, it seems to me, is a very significant leader in the Jerusalem church, although this fact is sometimes overlooked. Since Peter is the leader of the twelve most people look to him as a defacto leader of the church. I think this is a mistake, although Peter does continue to have some influence in Jerusalem (Acts 15). It is significant that there is no effort to replace James the son of Zebedee after he is killed. On the one hand, it is 13 years after the resurrection, so the pool of individuals who could be witnesses from John the Baptist through the resurrection is likely very small – even James the Brother of Jesus does not qualify as a witness under those requirements!